160 000kg – The total weight of the waste that has been redirected from landfill by TWTC’s Schools Recycling Project in Term 3 of 2014. “We believe that our contribution toward educating our youth about the importance of preserving our natural resources by recycling has made a huge difference already. People’s attitudes are really starting to change. No longer are we being asked why people should recycle, but we are being contacted from all over asking where people can recycle and how they can start up their own recycling initiatives.” – Vicky du Toit, Marketing Manager TWTC. Rendani Ramavhoya was appointed as the new Schools Project Coordinator in the beginning of the third term, “my first term at TWTC was somewhat an outer-body experience, I found myself out of my comfort zone and actually enjoying what I was doing.” Rendani’s schedule has been filled with assembly talks and depot tours for every week of the term and the first few weeks of the fourth term are already been filled too. “It really is exciting to see how enthusiastic the children get about recycling – some of them are really smart too, I have been outsmarted in assembly a few times now, especially by the aspiring science experts,” she says laughingly. Kabega Primary were overjoyed to find out that they had won first place for the third term, with a total weight of 7995kg. 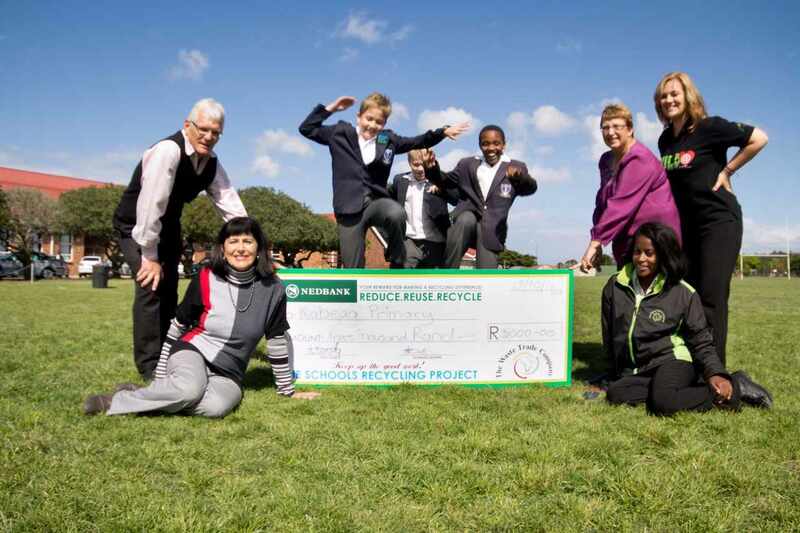 Adele Botha, who is the driving force behind Kabega’s Groenspoor prefects, has set a stellar example of how to run a recycling programme at school, “The Groenspoor prefects really work hard to make a difference, and to educate other pupils to do the same.” Not far behind Kabega Primary, was Sunridge Primary, in second place with a total weight of 7854kg. Bonita Slabbert, who dedicates a lot of her time and energy to the school’s recycling programme was pleased to once again be in the top three. In third place, with a total weight of 5225.5kg was BJ Mnyanda Primary. The school was very pleased to receive their prize as well as a new paper dome for the school that had been donated by Mpact Recycling. Mpact Recycling have been very generous by sponsoring the winning prizes for the top three schools for the third term. In the spirit of further raising awareness, TWTC Co-sponsored The Bob Richards’ Sundays River Trash Bash as well as the Builders Warehouse Recycled Gardening competition. Vicky du Toit, Marketing Manager for TWTC, was also very honoured to be awarded the PET Recycling Educator of the Year award from PETCO. “We can definitely see the positive change that TWTC has made – not only for the environment – but even in the lives of our staff,” Kay Hardy, General Manager for TWTC. Lisa Parkes, Marketing Manager for PETCO will also be hosting a workshop in Port Elizabeth on the 4th of November "A school recycling program is a hands-on, interdisciplinary lesson that educates learners about the environment and how to reduce waste going to landfill whilst ensuring personal responsibility and pride in their surroundings", says Lisa Parkes, Marketing Manager of the PET Recycling Company (PETCO). " The benefits of a well-run school recycling program go far beyond the actual school grounds as the surrounding communities can benefit from drop off facilities or collection drives. What's more learners are able to pass on newly learnt recycling behaviour to their families. We congratulate TWTC on their efforts in steering these most valuable initiatives" she adds. TWTC would like to encourage all schools to hop on the green wagon with them. “A school can start by simply forming an enviroclub. This is very important, as the enviroclub will be the driving force behind the project. Companies can also start recycling, thereby decreasing their carbon footprint, as well as helping raise funds for a chosen school or organisation. As for the general public, we have two public recycling stations where they can drop off their recyclables. One is in Admiralty Way, Summerstrand and the other is in 7th Avenue, Walmer at Walmer Methodist Church.” - Rendani Ramavhoya, schools project coordinator TWTC.